Set in the 1860s, the story of Lyddie Worthen is timeless. As a teenager from a broken home, her fierce independence and stalwart spirit is tested as she struggles to put the pieces of her life back together. When her family is split up, Lyddie is forced to leave home and fend for herself. Determined to reunite her family and buy back her debt-ridden farm, she sets out on a journey of self-discovery amidst the social change of the 19th century. Canada’s Industrial Age has arrived and Lyddie manages to find work in the cotton mills of Cornwall, Ontario. The work is hard, but the wages are good, so Lyddie and her boarding house friends ignore the risks in order to make a better life for themselves. Ultimately, Lyddie’s indomitable spirit is rewarded – she finds the freedom she desparately seeks, and the happiness she deserves. 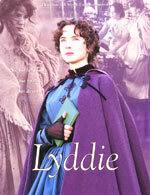 Lyddie is based on the Katherine Paterson novel of the same name. Her books have received literary honours including two Newbery Medals and two National Book Awards. Canadian actress Tanya Allen (Lives of Girls and Women) stars in the role of Lyddie. Diana, Lyddie’s mentor and boarding house confidant, is played by Christianne Hirt (Lonesome Dove). Simon James (African Skies) is Luke, a Quaker with whom Lyddie finds friendship. Saskatchewan-native Danielle Brett (Family Passions) is featured as Betsy. Tom Georgeson (A Fish Called Wanda) plays Mr. Marsden, the factory overseer. While a majority of the filming was done in Saskatchewan, the mill scenes were shot at the Queen Street Mill, in Lancashire County, England. The mill, built in 1894, is the last of its kind and is still operational with over 300 steam-powered looms. The 19th century was re-created in the movie, with skilled reproductions of period costumes, detailed set designs and authentic props. Lyddie is produced by The Film Works of Toronto, Regina-based Minds Eye Entertainment and Wall to Wall Television Ltd. of London, England. Executive Producers are Kevin DeWalt, Minds Eye Entertainment and Victor Solnicki, The Film Works. Eric Jordan of the Film Works, and Alex Graham of Wall to Wall Television are producers. Stefan Scaini is director.